Zen meditation practice leads towards an unconditional awareness free of internal commentary, judgements, concepts and self created boundaries. 1. Awareness meditation through focusing on our breath. 2. Awareness meditation through focusing on the Koan Mu. 3. Shikantaza, (just sitting) an open awareness meditation focusing on what arises in the mind and the subsequent letting go of what has arisen. Kinhin is a mindfulness excercise that takes Zen from the cushion into our everyday world. It is a walking meditation that combines mindfulness practice and awareness. Dokusan is a confidential face to face meeting between a student and a teacher. If a practitioner has determined to become a student of Zen, usually after having completed the introduction to Zen lectures and after having established a regular meditation practice, a formal request can be made to become a Zen student of a particular teacher. The process is quite simple, students approach the teacher they want to work with and ask the teacher to become a student. Once the teacher accepts the student, a practice path is then developed to suit the aspirations of the student. The student then works only with his or her teacher exclusively. A student can terminate the relationship at any time by simply discussing the matter as appropriate. Koan practice clarifies self realisation, freeing the many layers of acquired conditioning. Koans are usually phrases or dialogues between masters and students that were collected in ancient China and have survived until now. Koans cannot be intellectually grasped but only “understood” through the direct experience of practice. 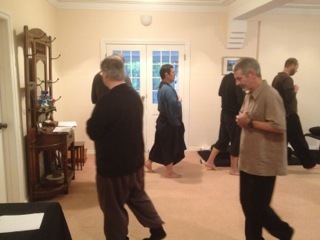 Sesshins are for practitioners who are comitted to intensive Zen practice that varies in lengths from 2 to 7 days. See our calendar of events for a full program. 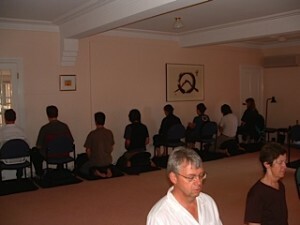 Single days of intensive practice are held monthly.